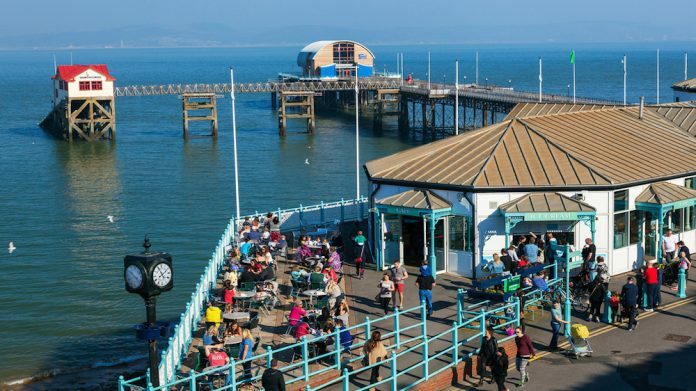 A visit from the head of the local legislature has seen Swansea Council praise Ameco’s project to maintain the town’s heritage by refurbishing its Victorian pier. Councillor Rob Stewart made it town to the pier last week to observe the £3.2m refurbishment work, which aims to see all of the Victorian structure’s deck- ing replaced by the end of the year. “Mumbles Pier is an integral part of Swansea, and I’m delighted the pier’s owners are investing in its future,”he said. The go-ahead for construction on the Grade II listed building was given at the beginning of the year – with plans also approved for additional decking to be added to the pier’s fore- shore end,enlarging floor- space sufficiently to allow for a new development aimed at recouping the costs of the maintenance project. For their part, pier-owner company Ameco welcomed Mr Stewart’s support for the work. As work continues, all of the site’s original Victorian features have been temporarily removed for preservation, whilst measures have been taken to ensure that RNLI crew continue to have ongoing access to the pier’s lifeboat house. Referencing other ongoing developments and investments in the Swansea area, Stewart maintained that the pier refurb was emblematic of a city heading in the right direction.